He was born “Wa-tho-huck”, a Sauk and Fox name meaning “Bright Path”, though his Christening certificate listed him as Jacobus Franciscus Thorpe. But he is known to the modern world simply as Jim Thorpe – possibly the greatest athlete of all time. He was born on an Indian reservation in Oklahoma, near the town of Bellemont to Hiram P. Thorp, the son of Hiram G. Thorp, a trapper, and No-ten-o-quah, a member of the Thunder Clan of Chief Black Hawk of the Sauk and Fox Tribe. His mother was Charlotte Vieux, who had been brought up as a Potawatomi Indian, but she was the daughter of a Frenchman, and an Indian woman, Elizabeth Goslin, who had both Potawatomi and Kickapoo blood. Jim Thorpe was one of 11 children, and had a twin brother, who died when he was only eight. In 1898, at age 11, Jim Thorpe was sent to the Haskell Institute in Lawrence, Kansas, one of the two Indian schools that had been set up by the U.S. Government and Military, where he remained until 1904. In June 1904, Jim Thorpe entered the second Indian school, Carlisle Indian School in Carlisle, Pennsylvania. There he became a legend as both a football player and track & field athlete. Thorpe’s football career at Carlisle has been well documented. He is considered the greatest American football player pre-World War I. He primarily played running back, but apparently could do everything on the football field. Less has been written of his track & field career. Thorpe was undefeated in the decathlon – he competed in only one, that being the 1912 Olympic decathlon. 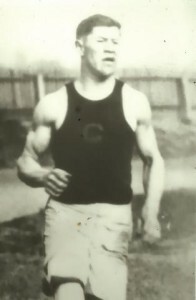 The first decathlons in the United States were the 1912 Olympic Trials, but Thorpe did not compete. There were only two entrants in the decathlon Eastern Olympic Trials, so Thorpe was added to the team based on the strength of his performance in the pentathlon trial the week previously. On 18 May, Thorpe had taken part in the pentathlon Olympic Trials. He won three of the five events and finished second in the other two to win the trials with a score of 7 pts. He returned to America and a hero’s welcome. On 2 September he competed in the AAU All-Around Championship, the early American forerunner of the decathlon, which he won, breaking Martin Sheridan’s world record in the process. He scored 7,476 points and won by over 3,000 points. His track & field career was over. Jim Thorpe also played professional baseball. It has been written that he was a poor excuse for a major league player, but this is probably unwarranted denigration. He was no star, but he was an adequate major leaguer. In his final major league year, 1919, he batted .327 for 62 games. His career major league average was .252. But most of his early baseball career was spent in the minor leagues. He played for the Rocky Mount Railroaders in 1909-1910, pitching and playing the outfield. After the 1912 Olympics, he was signed by the New York Giants and began a 7-year major league career, playing 6 seasons with the Giants, some time with the Cincinnati Reds, and finishing one year with the Boston Braves in 1919. In 1920-22 he extended his career, playing Triple A ball in the three major Triple A leagues, with the Akron Buckeyes (International League), the Toledo Mud Hens (American Association), and the Portland Beavers (Pacific Coast League). Jim Thorpe later played professional football, but by then he was definitely in the twilight of his athletic brilliance. When Thorpe starred for Carlisle on the gridiron, there was no true professional football league, although there were scattered barnstorming teams. While still playing major league baseball, Thorpe signed with one of them in 1915, the Canton Bulldogs. He was paid the then astronomical sum of $250.00 (US) per game. He played for the Bulldogs from 1915 through 1919 while they were still an independent team. By then he was 32 years old, but still the most feared runner in the game. On 20 August 1920, the National Football League (NFL) was established among four barnstorming professional teams from Ohio – Akron, Canton, Cleveland, and Dayton. Because of his name and prominence, Thorpe was appointed as the first president of the National Football League. Thorpe continued to play as well, since he was the biggest drawing card in the nascent league. Jim Thorpe played in the NFL from 1920-26 and again in 1928. How good was he as a football player? As did many other magazines, Football Digest produced an end of century special in June 1999, listing the Top 100 football players of all time. Thorpe was ranked 17th. When his athletic career ended, Thorpe turned to Hollywood. He worked as an extra and stuntman in numerous movies, but never earned much money from his acting career. He later turned to drinking heavily, and he would eventually die, while living only in a trailer, far from auspicious surroundings for the one-time greatest athlete in the world. In early 1913, it was revealed that Thorpe had played minor league baseball in the United States, as described above. For this he was retroactively declared a professional by the AAU (Amateur Athletic Union) and the IOC and his records at the 1912 Olympics were declared void. He had to return his gold medals, and his Challenge Trophies. What is not so well known is that Thorpe should never have been disqualified in the first place. Personal Bests: HJ – 1.956 (1912); LJ – 7.16 (1909); Dec – 6564 (1912).